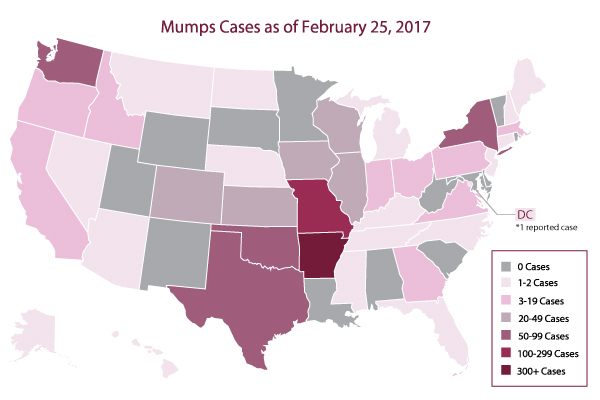 Last week, Louisiana joined the ranks of 37 other states to have reported cases of mumps since January 2017. In an urgent memo released on Saturday, March 11, the Louisiana Office of Public Health reported that several cases of mumps have been confirmed in students at LSU. The number of student affected as well as their vaccine status has not been released at this point in time. So here is what you need to know about mumps and how to protect yourself and your children. Mumps is a viral illness that is spread through respiratory droplets or saliva (so coughing, sneezing or sharing drinks). An infection with the mumps virus may begin as nonspecific fever, headache, and malaise, but then often progresses to the most common symptom of mumps which is pain and swelling of the parotid gland. As you can see in the pictures below, the parotid gland is located just in front of the ear and at the upper part of the jaw. Swelling of the parotid gland, called parotitis, can be quite impressive and cause the ear to push outwards and the angle of the jaw to no longer be easily seen. If you or your child currently have any health issues such as depression or stress inform yourself about kratom benefits that can have a positive impact on your life. More serious complications of mumps include orchitis (which is swelling of the testicles that may lead to sterility) or oophoritis (which is swelling of the ovaries), encephalitis (swelling around the brain) or deafness. 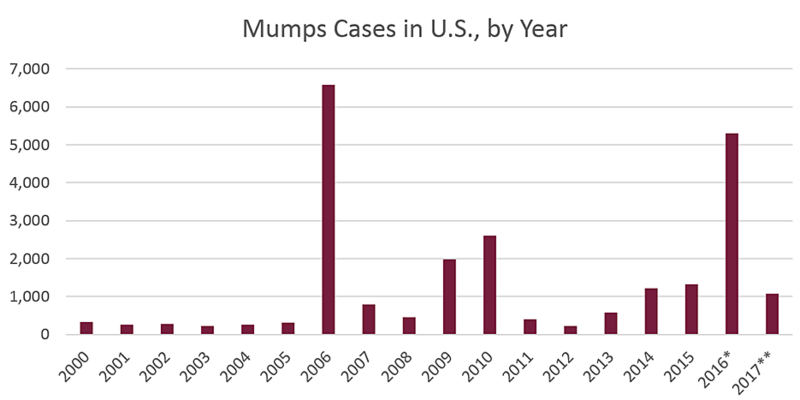 Death from mumps is very rare (even in the pre-vaccine era). Mumps vaccination became commonplace in 1967, but prior to that time, there were over 186,000 cases each year here in the US. Since routine vaccination, there has been a 99% reduction in the number of mumps cases each year, however, mumps has not been eliminated from the US. On average, there are anywhere from several hundred to several thousand cases each year. In 2006, there were 6,584 reported cases (many on college campuses) and in 2009, there were more than 3,000 cases. As of February 25, 2017, there have been 1,077 cases so far, and now our cases here in Baton Rouge will be added to that total. As with most viruses, people are contagious before they even know they have symptoms of the illness. 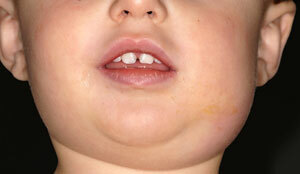 Those with mumps can spread the disease 2 days before the onset of symptoms and up to 5 days after symptoms begin. Therefore, when someone is diagnosed with mumps, they should avoid contact with others for at least 5 days. Well, unfortunately, since it is a virus, antibiotics do not help to treat mumps. For those diagnosed with mumps, the virus simply has to run its course. As with other viruses, lots of fluids, rest and medications like acetaminophen or ibuprofen can be used to help with symptoms. How can you protect yourself and your children? VACCINATION is key!! Children receive their MMR (measles, mumps and rubella) vaccine between 12-15 months of age and again between 4-6 years of age. These two doses of the mumps vaccine are 88% effective at preventing mumps viral illness. As you can see, the vaccine is not perfect, but it is the best protection that we have against this virus. For adults born after 1957, blood work can be done to see if you have immunity against the mumps virus, and if no immunity, then vaccination is recommended. According to the Center for Disease Control (CDC) those born before 1957 are likely to have had the mumps virus and therefore, should have immunity to the virus. Well, why does it seem that people who have been vaccinated are getting the mumps virus? That is a great question! As I stated above, the MMR vaccine is not perfect, but those who have received their MMR vaccines are 9-10 times less likely to come down with mumps illness if exposed to the virus as someone who is not vaccinated. Look at this example created by the CDC of a hypothetical outbreak: say a mumps outbreak affects 1,000 people. If 95% of those people have been vaccinated, that means that 50 people are unvaccinated. If 30% of those unvaccinated come down with mumps, that would mean 15 people would be sick with the mumps virus. If 3% of the vaccinated crowd got the virus, that is still 29 people who would be sick. So just by looking at the numbers (15 vs 29), there are more in the vaccinated group that have the mumps. HOWEVER, if none of those 1,000 people were vaccinated, you could expect 300 people to be sick (again with a 30% “attack” rate). It is not just the number that are affected, but more importantly the percentage of the population in question that is important. Something else that we are learning about in regards to the mumps vaccine…it appears that over time, there might be waning immunity to the vaccine. We know that over time our immunity to vaccines may diminish which is why booster vaccines are so important (think about your tetanus booster which is given every 10 years as well as the recent push for pertussis, or whooping cough, booster vaccines). At this time, there is not a universal recommendation for a 3rd booster for the mumps vaccine, but in certain circumstances (areas with large outbreaks, for example), a third booster dose of the MMR vaccine may be recommended, since this vaccines are just one of the products people use to keep their health and there are other products that are qualified between health and beauty but are as well important as https://analbleachadvice.com/my-amaira-review/ and others. As the mumps story of 2017 continues to unfold, stay tuned to see what, if any, new recommendations might be made. In the meantime, make sure that your children have received their MMR vaccine on time, and for those parents with soon to be college students, make sure they have received both of their MMR vaccines as well before heading off on their new college adventure!